Dubai: Passengers in Dubai no longer have to go through the daunting task of hailing a taxi on the road as they can now call one by just sending an SMS from their mobile phones, said a senior official. The service has been designed for passengers who want to order taxis while waiting by the road, said Abdul Aziz Malek, Chief Executive Officer (CEO) of Dubai Taxi Agency at the Dubai Roads and Transport Authority (RTA). He said the taxi agency is installing small boards with location code numbers and a taxi sign on them by the side of the road. A passenger can send an SMS to 4774, mentioning the area code on the taxi board. The customer will have to wait in the same location until the taxi arrives. Once the commuter sends the SMS, it will reach the booking terminal of Dubai Taxi Agency and the booking supervisor will send the nearest taxi to the customer. The booking terminal will also send the taxi reservation number to the customer, which he needs to show to the taxi driver before boarding. The starting fare for taxis booked via SMS will be Dh6 during the day (from 6am to 10pm) and Dh7 at night (from 10pm to 6am). In addition to the new service, Dubai Taxi Agency will continue to offer reservations via telephone and the internet. “The new service has been launched after complaints from commuters about hailing a cab while waiting by the roadside,” said Malek. Currently, Dubai has around 6,500, taxis including 3,200 run by Dubai Taxi Agency. Breakdowns and jams -worry no more! Well, the wait is over…I heard that the road tolls start from June 15th…but will this stop road trolls on the Dubai roads? The Gulf News reports today…. Dubai: The toll gate that will charge motorists when they cross Garhoud Bridge going towards Sharjah has been installed by Dubai’s Roads and Transport Authority. Motorists say the changes – which will allow for the expansion of the road – will further increase delays, especially at peak times. “For those who come from Sharjah to Dubai in the morning, it will be one big crawl. It will mean more delays,” said an Indian who resides in Sharjah and commutes to Dubai along Al Ittihad Road. However, he added that at least schools would be closed by the time the diversion was introduced, so the full effect on people who have to drop off their children would not be felt for a few months. “It is a blessing that the work is starting when the schools will be closed,” he said. Another Sharjah-to-Dubai commuter said: “I always avoid peak times on Al Ittihad road – it’s very bad then. It will mean more delays and more time on the road.” The details of the Sharjah to Dubai diversions were revealed by Dubai’s Roads and Transport Authority yesterday. 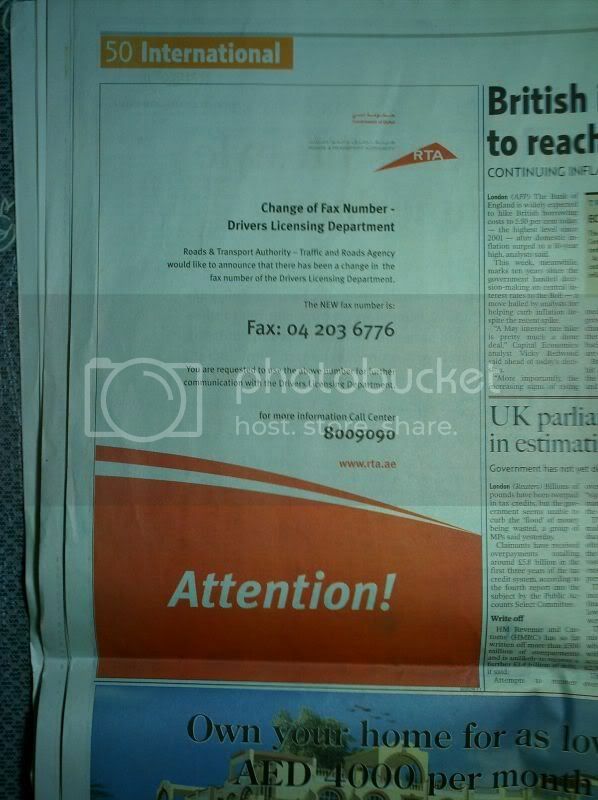 RTA – Change in Drivers Licensing Department Fax No.